The tourism sector continues to be one of the fastest-growing and most vibrant sectors within the South African economy, which is why BBF Safety Group (BBF) is dedicated to supporting students on the Ray Mhlaba Skills Training Centre (RMSTC) participating in its hospitality training programme through the donation of footwear. “Almost half of South Africa’s adults under 35 are unemployed. Through donating safety footwear to students completing their NQF Level 4 in Professional Cookery, we are enabling the upliftment of young adults in Port Elizabeth, working to reduce poverty and creating citizens who positively contribute to South Africa,” remarks Silvana Lennox, BBF Safety Group Key Account Consultant. Supporting and uplifting the communities in which it operates, BBF is dedicated to positively impacting South Africa’s economy, and young adults who are the nation’s future workforce and leaders in business. 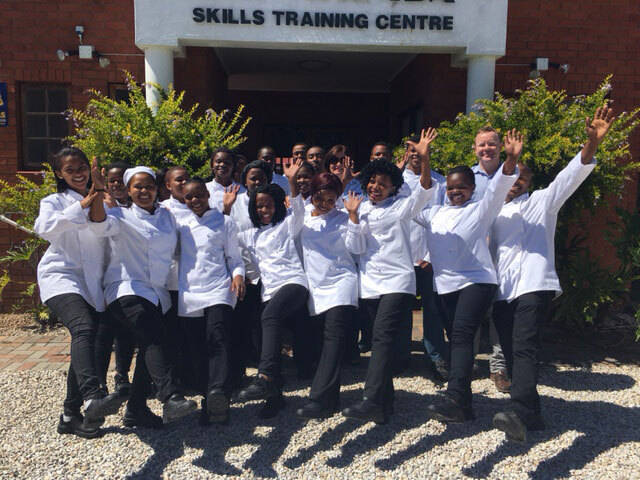 “The 41 pieces of donated footwear means that our students can now have complete, professional uniforms which will allow them to train correctly and prepare for formal employment within the hospitality industry,” remarks RMSTC Project Director, Caroline Ferreira. To date, RMSTC has trained 1,038 students in its vocational training programmes, 82% of which are employed or earning a reliable income as an entrepreneur. “We are proud to partner with organisations like RMSTC as they share the same vision and wishes for South Africa’s future as BBF,” closes Lennox. Students at the Ray Mhlaba Skills Training Centre now have complete, professional uniforms which will allow them to train correctly and prepare for formal employment within the hospitality industry. Written and distributed for BBF Safery Group by Boomtown. For more information please call Kimberley Clare Ogden on 076 321 8918 or email kimberley@boomtown.co.za. BBF Safety Group (Pty) Ltd. (BBF) is the largest manufacturer of safety footwear in Africa. With eight brands under their umbrella, catering to the various needs, applications and budgets of the PPE market, BBF provides a single safety footwear solution. The Ray Mhlaba Skills Training Centre (RMSTC) is an extension of the EP Child and Youth Care Centre. A non-government funded organisation, it relies on the support of corporate and private donors. The RMSTC focus is to assist in the government’s financial obligation to reduce poverty and unemployment of underprivileged youth 18-25 residing in deprived circumstances, by empowering them in skills and social development programs equipping them with the knowledge and ability to obtain formal employment or become entrepreneurs. RMSTC offers a variety of SETA Accredited and Entrepreneurial Training Programs in, Hospitality Studies, Bakery, Woodwork & Upholstery, Hairdressing, Early Childhood Development, Needlework & Crafts and HIV/AIDS & Palliative Care. In addition to vocational training programs it enrolls all students on to a Personal Development Program/ The objective of incorporating programs is to assist students in acquiring the knowledge, skills and attitudes necessary to become successfully employed and independent in their community environments as well as the confidence and knowledge to address any arising social challenges. RMSTC beneficiaries are youth residing in children’s homes whom are unable to cope with mainstream education, orphans due to HIV Aids and other circumstances, youth from child headed households, unemployed and/or physically handicapped youth residing in disadvantaged communities.